A sporty, two person touring kayak with outstanding high quality fittings. The Odyssee glides through the water with good tracking and is easy to maneuver and control, also making it possible to paddle small rivers. The proven performer year after year. The Seayak is one of the most popular and versatile open water boats ever made. The upswept bow and stern design of the Seayak is influenced by Greenland style open water boats and provides exceptional rough water handling for small to mid-sized paddlers. The HTP blow-molded construction combined with sleek lines and a very functional design create an unbeatable package for the hard-core or casual open water paddler. The Seayak’s Trihedral hull cross section provides outstanding speed, stability and, without question, the most amazing glide in a plastic-touring kayak. 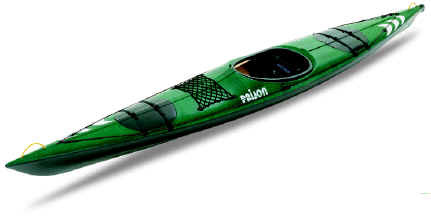 Yukon E is a graceful and speedy high performance touring boat with classic shape of traditional Eskimo kayaks. Easily maneuvered, quick to respond and precise carving are all attributes of the Trihedral hull. The most amazing of all is the combination of quick acceleration and unreal glide of this boat. What a gem and full of features like deck line, bow deck pack net, recessed fittings, gas pedal style rudder control and spacious flush to the deck bow and stern hatches that combine neoprene, polyethylene plastic, and quick-release webbing straps. The cockpit area is ergonomically accurate and easy to get in and out of. Perfect for day trips or extended treks.